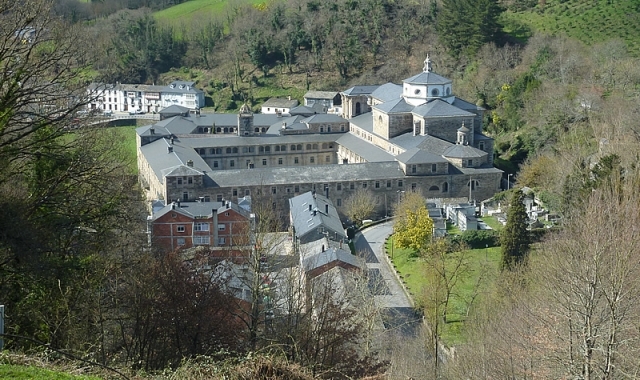 Although this variant that reaches Sarria via Samos has always been secondary and has a number negative aspects, such as long sections circulating on asphalt, in its favour it does benefit from spectacular landscapes and landmarks, beyond the main attraction of the day, the Monastery of Samos. The itinerary, after leaving Triacastela, continues along the bank of the river Oribio and leads the hikers through lush riverside forests, with oak and chestnut trees. In addition, it approaches beautiful villages surrounded by nature, such as San Cristovo and Renche, living examples of the architecture so popular in this area. On this variant pilgrims will not encounter the typical milestones that discount the distance to Santiago, they have been reserved for the route through San Xil, however they can follow the characteristic yellow arrows that mark the route. The hiker will not find many fountains or establishments with services. It is therefore recommendable, especially in low season, to make a stop in Samos, where they will find all kinds of services. 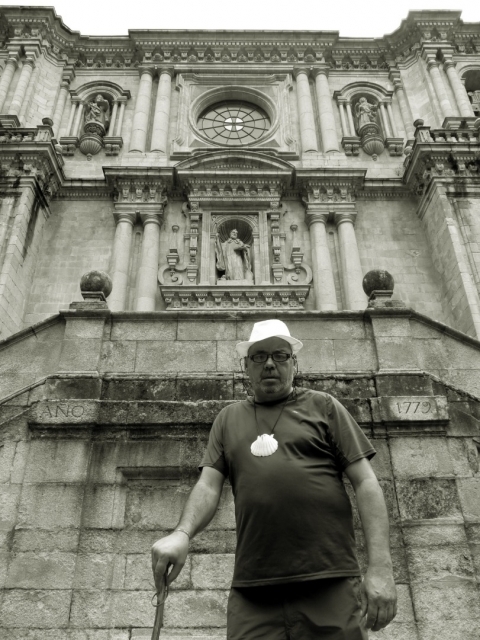 The journey for pilgrims begins at the foot of the municipal albergue situated at the entrance of Triacastela (134 kilometres to Santiago). After crossing the centre and reaching the square, Plaza de la Diputación, where they will also find a town council building, the pilgrims should leave behind council building and turn left along the LU-633, the road to Samos. This first itinerary towards the south poses some danger because it is on the road itself, with no hard shoulder or pavement. Although the yellow signs are located on the right, it's almost better to continue on the left because at least on this side there are some sections that run on a path parallel to the road to help the walkers, especially those with children. Having now covered three kilometres of the stage, pilgrims reach a sign for one of two rural houses of the day, Casa Arza, from which they can divert. The route, however, continues straight ahead, shortly after, and by now in the area of San Cristovo they will pass a second sign indicating the official ancient way. To join the route they take a signed detour to the right, on an asphalt and gravel path with a slope of 25% which becomes less pronounced towards the end and reaches the entrance to this idyllic village, bathed and divided by the river and in which is located a church with a prominent seventeenth century Baroque altarpiece. San Cristovo do Real (17.6 kilometres to Sarria) an enclave which hides a number of examples of rural Romanesque architecture, an outside washing area and a beautiful bridge that invites the walker to relax and soak up its laidback atmosphere, where time seems not to pass. Here visitors will also find one of the few bars on the first part of the day (Café - Bar San Cristóbal), it opens around 10.30 but does not serve food. The itinerary leaves behind the local cemetery on the left and progresses on a path to the right through the valley of Oribio, where walkers will advance through lush areas of chestnut, poplar and aspen trees, without doubt, one of the nicest stretches of the day. Shortly after leaving the centre of San Cristovo and at a junction the walkers should turn left where they will find the hostel Casa Forte Lusío. This establishment, located 400 meters from the pilgrimage route occupies an old noble manor house, founded in 1551. Interestingly it was the birthplace in 1804 of Vicente María Vázquez Queipo, a brilliant mathematician and the inventor of the table of logarithms. The property, owned by the Benedictine monks of Samos chose to assign the building to the regional government to be earmarked as a hostel. Initially they also considered turning part of the building into a museum dedicated to the life and work of the mathematician (whom was also a physicist, a lawyer and a Secretary of the Interior) but, for now, this project is on hold. After passing the junction that leads to the hostel, the route continues along a dirt path with some ruts and potholes and is accompanied by the river on the right. Hikers cross the bridge and embark on some gentle ascending and descending slopes before reaching, on asphalt Renche (15.96 kilometres to Sarria), another highlight of the day. Its famous ancient mills are worthy of calm contemplation. The Camino borders the parish church and the adjoining cemetery and, immediately after it climbs a slope to the LU-633; the road, 50 meters later is abandoned, after passing a resting area with picnic tables. From here the route deviates to the right along a track on a slope of 21%. The immediate objective is Lastres (15.59 kilometres to Sarria), a small enclave with no services, accessed after crossing new bridges and facing another significant climb. From this point, and on a continuous slope, the ground goes through a number of changes, from compact earth with loose stones-making it difficult to maintain a constant rhythm-to gravel and dirt tracks. Once again in ascent they reach Freituxe (14.29 kilometres to Sarria), a village with a small chapel and a picnic area, soon later, and after facing a steep decline on bad ground, with large loose stones and successive furrows, and a new pass over the river they reach the beautiful town of San Martiño (13.1 kilometres to Sarria). In this centre a rural Romanesque late twelfth century temple constructed from slate masonry stands out. After another slope the route goes through a tunnel that passes below the LU-633 to turn left and cross a little later, without a pedestrian crossing, another road. The route then continues next to a stonewall on a stretch of uneven ground which gradually descends to Samos (11.28 kilometres to Sarria). At a curve in the road pilgrims have the opportunity to take the best snapshot of its Benedictine Abbey. The descent, which reaches 20%, does not ease until reaching the first houses of the enclave and some establishments offering several services to travellers. Here they will find a grocery shop, mechanics and a bar that leads to an area of stone slabs. The thousand-year cypress To the right the well-known monastery rises majestically into view, walkers can access it from either side of the river Oribio. After visiting the abbey of Samos (Walkers should consult opening times prior to their visit to try and accommodate it to their arrival), pilgrims are advised to go back 100 meters so as not to miss the Chapel, Capilla de Salvador- of Mozarabic style, built in the late ninth century- and the ancient cypress tree, Ciprés milenario (the thousand-year cypress) that is almost attached. This tree is one of the 50 most notable in Spain. After this stop hikers should retrace their steps and cross the village along its main avenue. Passing a beautiful music stand and a 1936 fountain to join again, at the exit of Samos the LU-633, which walkers are recommended to take on the left side. From the left Pilgrims will pass a monument erected in their honour and, more importantly, a number of resting areas dotted along the route. In Teiguín (9.52 kilometres to Sarria), hikers will encounter some bridges and walkways, outdoor picnic tables and a play area for children. Almost in Sarria After two kilometres on this stretch parallel to the LU-633 the route finally abandons the road and Teiguín-an enclave with a beautiful restored chapel- walkers cross the road, without a pedestrian crossing and take a deviation to the right that leads to a short, steep climb to the village of Pascais. It descends on a stony path and crosses a stream to reach the church of Santa Uxía of Pascais and its rectory. The day faces another of its most beautiful stretches, taking walkers back to the river. Along successive climbs and descents, that alternate between sections on earthy paths and asphalt or concrete, the pilgrims pass through small enclaves, such as Gorolfe-where they can relax in a rural house 300 meters from the route (Casa rural de Díaz) - while they near riverside spots that almost always run along the right bank of the river. Care should be taken to follow the route indications, in particular on the slope that nears the river Sarria- the section where the itinerary diverts to the right, and just before Veiga de Reiriz (where the arrow is painted on a wall), at these points it is difficult to know which direction to take. In this hamlet (Veiga de Reiriz) pilgrims will find a house with a drinks machine offering hikers a well-deserved refreshment before tackling the last part of the stage. Two climbs still remain before reaching the hamlet of Perros and welcoming the council of Sarria. 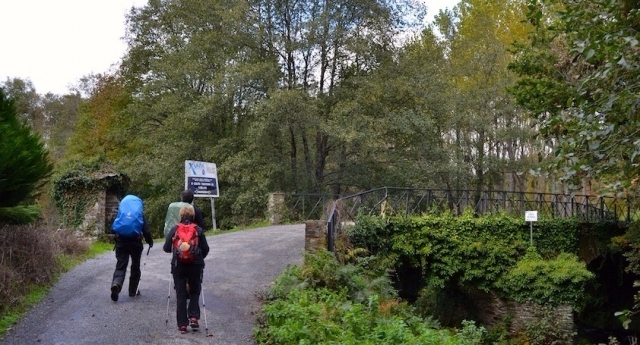 In a last effort pilgrims cross the LU-5602 over a bridge and reach Aguiada (4.7 kilometres to Sarria), a centre where this route merges with the other from San Xil. Walkers then proceed along a path parallel to the road until arriving at the hostel Paloma and Leña, which benefits from large green aas. A sign at the entrance informs those pilgrims who want to stop that they will be invited to tea. 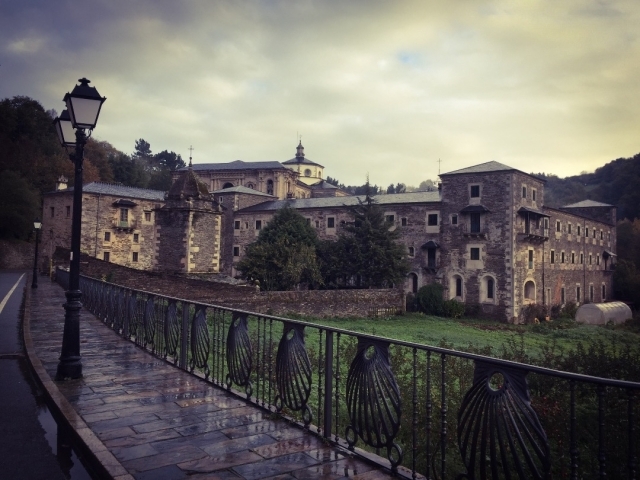 In a final stretch which is advanced at speed, the pilgrims reach first of all Vigo de Sarria, a hamlet that was engulfed by the capital during the construction boom and has now become a kind of neighbourhood, accessed a little before reaching the urban labyrinth of Sarria itself. After passing Triacastela the route for cyclists is very easy along the LU-633 road- although, care should be taken during the first few kilometres- bikers face some complicated stretches, particularly the entrance to Lastres and San Martiño because of, successive potholes and loose stones. The slopes at these points are also considerable. From Samos many cyclists continue on the asphalt road to Sarria, along the same aforementioned road instead of tackling the climb to Pascais. For those who choose this option, there is a recommended place to stop 300 meters from the turnoff. Mesón A Pontenova, a classic pilgrim establishment that offers visitors a typical local dish of eels. 1 reviews Distance to Santiago: 126 km. 1 reviews Distance to Santiago: 114 km.